Pride season is upon us, and this year we’re ringing it in by spotlighting the folks who make us proud to show up to work each day — the artists, activists, performers and personalities who make our community shine. Peter Kim is a Korean American raised by Christian immigrants from Flushing, Queens. 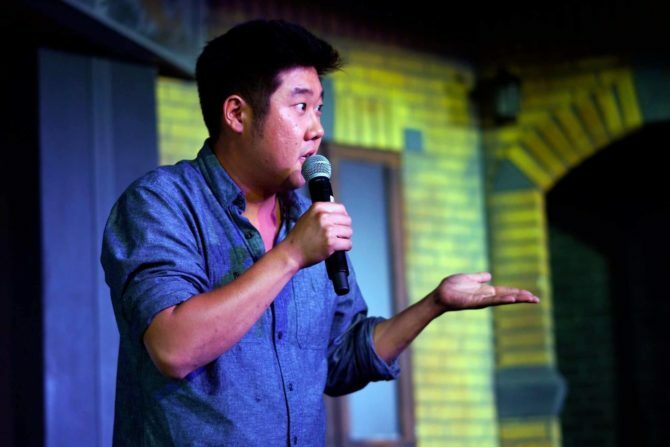 He is a comedian, writer, and actor based in Chicago, with credits including The Second City, SeeSo’s “Shrink,” and NBC’s “Chicago Justice.” He also hosts a weekly podcast called “The Ajumma Show” (Ajumma being the matriarch of the Korean Community) and live Queer themed shows “Baby Wine’”at The Annoyance Theater and “The Kiki” at The Laugh Factory. Follow him at @peterkz or visit www.paypeterkim.com. What was your most awkward Pride moment? Two years ago, in Chicago, I was invited to ride on a float sponsored by a progressive talk radio station so there was no music, thus very little dancing. So we just cheered a lot and threw beads at people. Which city’s Pride is on your bucket list? I keep hearing great things about Provincetown so would really love to check out P-town’s Carnival. Seoul’s Queer Cultural Festival sounds incredible as well. The idea of being around a bunch of Korean Queers sounds like a dream! Does Pride feel different this year? I remember last year I thought it was going to be the biggest Pride ever due to the passing of the Marriage Equality Act. But I think this year’s is even more important to us because of the ultimate Mother-boy, Mike Pence. “Born This Way,” as if it were a choice! The ultimate pride outfit is something that accentuates your best assets. So for me that’s a light weight ensemble that modestly covers everything except for my legs. Pretty sure the RompHim’s gonna make an appearance this year. What are you doing for Pride this year? Actually I’m going BACK on that float I was on 2 years ago, but this time we’re bringing our own music. Also, this will be the first year I’m going to Pride with a committed boyfriend, soooo I guess we’re gonna have to break up soon! Isn’t this the guy who thinks asking you where you’re from is “white supremacy” or something?